Here is a draft of a potential chapter. I may use it in the memoir, but the story was prompted by Isabel D’Avila Winter in my creative writing workshop last week for the biggest lie I have ever told. I have not shared any memoir pieces lately, because I have not been writing much, but here it is for my readers who enjoy the memoir stories on Tribalmysticstories. Kerosine/oil lattern: Public Domain image. 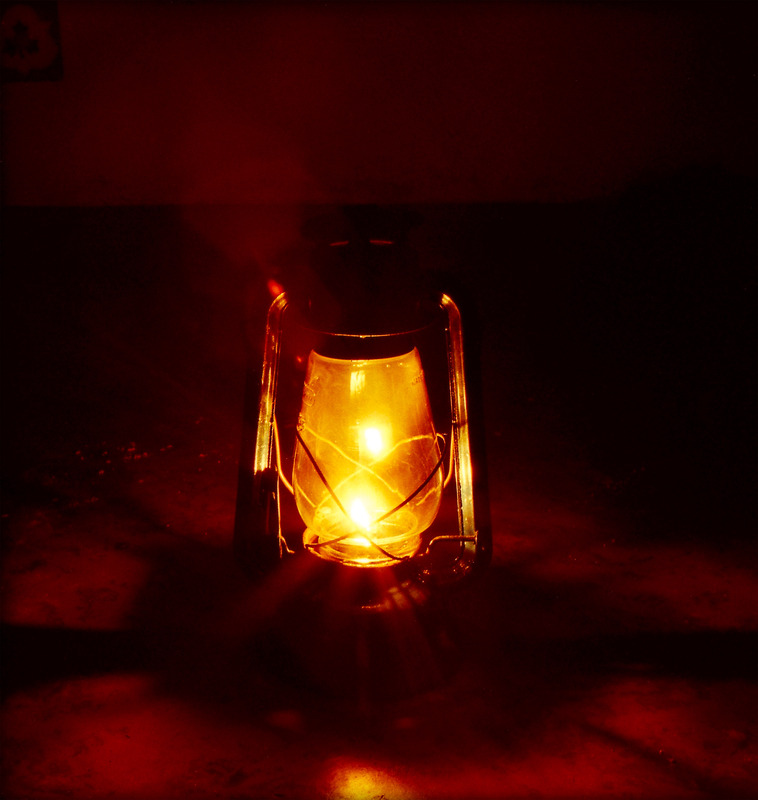 The Chinese kerosene lamp burnt low. It was close to me and I smelt the kerosene cut into floral smells from the freshly washed bed sheet. In a continuous dance, its golden-yellow flame peaked in a steady poise and melted into the dark head of the small metal lamp. The lamp was barely taller than my school ruler but it gave enough light for me to see the print. The flame in the round clear glass, size of an orange, outlined the specs of paprika stains on the lamp. At the same time, the flame threw a soft orange ambiance under my sheet and even around the room. If I moved too quickly, I could knock the lamp over and burn myself because the lamp was partially under the sheet, and next to my book I was reading. This was my private and peaceful space where I read my books. This was also against Mother’s rules. Having a lamp to myself was a luxury I rarely had in a noisy, crowded house. My mother and I had a small room about three by three metres and my older uncle (of two uncles) and his wife shared another larger room with their five children. My grandmother and aunty shared the last one. My younger uncle was away at the University of Technology, about 20 minutes from my village. My uncle was the first man from our village to go to university. It was a house where everyone knew everything that was going on. My family had this one Chinese lantern to use as an inside lamp and one Coleman lamp as the outside lamp. Both lamps burnt on ‘kero’ as the villagers referred to kerosene. Fire was the main source of light and there was a torch, which hardly had batteries because no one could afford them. The torch was mostly used for travelling between the village houses. It was also used to visit my aunts and uncles or for going to the pit toilet away from our house – not for reading or using as a room light. If we left the village to fish or camp, the Coleman and the torch came with us. I knew I was using the 20 cents kerosene up but I was solving a mystery with Nancy Drew. I liked being a detective myself. “Ampom” mother called and without saying, I knew she called me for dinner. She used one of my names that meant, light-skinned. “Ok” I said, without moving. In the village, kero sellers would buy wholesale in 44-gallon drums in Lae City and retail the kerosene to us in re-cycled wine or spirit bottles – charging 20 cents per bottle. It eventually became 50 cents and then a $1. That was in 1970s. Wholesalers bought kero from service stations and general stores. My cousin and I would take our bottle, a clear Vodka re-cycled bottle, and I did not remember which of my uncles drank the Vodka – to any village retailer for kero. We stood there while they pumped the kerb into our bottle but there was a special technique where the boys in the village mastered. The pump would be pressed a couple of times and stopped. The air would push the blue liquid from the drum through the transparent pump into our re-cycled bottle. You have to stop the pump quickly or it sprayed the kero everywhere. I always thought it was cool and I wanted to have a go at pumping the kero this way. At home, every night, once the kero was put into our Coleman lamp and some in the Chinese lamp – my family gathered in our blackened old kitchen and ate their dinner. The floor was uneven and with the weathered timber leaving gaps in between, we dropped the bones of chickens and pork to the village dogs and pigs, which fought over it. Sometimes the fights would become too aggressive and the animals would run into the fragile posts so it felt like the kitchen would drop off the side of the main house. My cousins and I would get scolded for dropping our scraps down the timber gaps. Tonight, my family were only a few metres away from me separated by a couple of walls. I turned the lantern wick higher for more light. I adjusted my bed. Most of the kapok had fallen out or shrivelled in my pillow so I tucked some clothes under it and raised my head. I reached up with my book and turned the pages. I knew Mother would place my food on the bench top, near the hot teapot, so it will stay warm. Sometimes grandma would place the covered food at the fireplace and they both would insist I go out and eat before bed. Both mother and daughter always respected my reading and schoolwork, but sometimes, my mother would agitate me with her calling. On this night, I wanted to finish my book. “I am coming soon”. I turned to the next page and read faster. This was not fun, but I tried to go as fast as I could without skipping any pages. A few minutes later, mother called again and I could tell she was getting angry. I was not ready to eat. I did not answer. I removed and turned the wick on the Chinese lamp so low, the room became dark. I shut my eyes and put Nancy Drew away. I was annoyed at my mother. I was hungry but only to find out what had happened in the story. “Ampom!” I heard mother yell. I did not answer her. Mother rose from the floor in the kitchen, and I heard her march to our bedroom. She opened the door by pushing hard against the grating sand on the floor. The door did not have a lock. I had shut my eyes and twisted my body into an awkward position and pretended I was asleep. Mother started calling my name and sat down and tried to shake me. I did not move. Mother lifted my shoulders and my head rolled back as if I was unconscious or dead. I was supposed to pretend I was asleep, but somehow, the idea of being dead entered my head – so I went with it. “Ampom, tisa, tisa” – Mother begged in Bukawa for me to wake up. “Giuc – Giuc!” mother started calling her sister. My aunt was shocked by the tone of my mother’s voice and tried to ask my mother what was going on. There was no time for mother to explain. By now my mother became hysterical and started calling her own mother for help because she thought I was dead. In minutes – everyone rushed into the small space on my bed and started pulling my hair and calling all my four names. They would throw cold water on me next to try to wake me. I finally ‘woke’ up to the relief of my mother – who was already crying. I told Mother I lied and I was pretending to be asleep and she did not believe me. I told her; I only wanted to have some peace and quiet – and even some light to read my book. Being a nurse, she was not convinced so she gave me a thorough check up; feeling the temple, checking the eye-balls, checking the ear and the throat. And then, I had no choice but to go outside and eat. Previous PostXanadu’s Dragon Heads – Science DiscoveriesNext PostHearing With Your Tongue? Sounds Weird? Thank you very much Lou. I’m glad you enjoyed it.